Studying the history of the Rohatyn region and east-central Europe in general is hampered by several problems; significant among those for understanding the place of Jews in regional history are problems of perspective (segregated histories by ethnicity and language) and of focus (the four-year Holocaust dominates much of the research and writing). In our reading we have attempted to broaden both our perspective and our focus, with mixed success. References we have found useful in our work are listed below, but we know this set represents only a fraction of the relevant resources. See also the several Jewish memoirs of life in Rohatyn and surrounding towns, especially the Rohatyn Yizkor Book. Additional references are also listed among the sources on each of the history pages on this website. Paul Robert Magocsi; University of Toronto Press; 2nd Edition, Toronto, 2010. A critical history of the land of Ukraine and its many peoples, with careful attention to the importance of historical perspectives by different groups (Ukrainian, Russian, Polish, Soviet). With detailed information from earliest years through the Orange Revolution, the book is an important resource for setting contemporary events and discussion in historical context. The Rohatyn town square, destroyed in WWI. Source: Austrian National Library Bildarchiv. Plokhy, Serhii; Penguin Books; 2015. A compact history of Ukraine and Ukrainians, with careful attention to Ukraine’s place as a geographic and cultural transit point between east and west in Europe. The history of Jews in Ukraine is included among the many other peoples who have shared the land either by migration and settlement, or by invasion. Kirshenblatt-Gimblett, Barbara, and Antony Polansky, editors. 2014. Warsaw: Museum of the History of Polish Jews. More than a catalog of the core exhibition of Polin: Museum of the History of Polish Jews (see below), this book describes the shared but very diverse historical experience of Jews in lands now part of Poland, Ukraine, Lithuania, Belarus, and beyond. Tangible and intangible culture are used to illustrate the relationships between the many different Jewish communities and their integration with non-Jewish communities throughout historical Poland. Various editors and editions; The Littman Library of Jewish Civilization; Liverpool University Press; also available as an e-library. Volume 12 – Focusing on Galicia: Jews, Poles, and Ukrainians 1772-1918; Israel Bartal and Antony Polonsky, eds. ; 1999. Volume 24 – Jews and Their Neighbours in Eastern Europe Since 1750; Israel Bartal and Antony Polonsky, eds. ; 2011. Volume 26 – Jews and Ukrainians; Yohanan Petrovsky-Shtern and Antony Polonsky, eds. ; 2014. Volume 29 – Writing Jewish History in Eastern Europe; Natalia Aleksiun, Brian Horowitz, and Antony Polonsky, eds. ; 2016. Rodal, Alti, exhibition curator; Ukrainian Jewish Encounter; Canada, 2018. The catalog to a traveling exhibition of the same name and a standalone historical survey, the heavily-illustrated text traces the experiences of Jews on Ukrainian lands from the time of their arrival through the partitions of Poland and up to the start of World War I. Highlighting points of contact between Jews and Ukrainians in both cooperation and conflict as well as simple co-existence, the book follows the development of national identity of both groups and their interaction with governments and others. Available as a free pdf on the UJE website linked above. Ansky, S.; edited and translated from the Yiddish by Joachim Neugroschel; Holt/Metropolitan; New York, 2002. Excerpts from the diaries of noted playwright, journalist, and ethnographer S. Ansky (or An-sky, real name Shloyme Zanvi Rappoport), who was attached to the Russian imperial army in World War I to organize relief for Jewish communities in the war zones. When Russia occupied portions of Austrian Galicia, including Rohatyn, Ansky worked to provide shelter, food, and encouragement to displaced and homeless Jews. The detail and horror in his daily record are astounding. Snyder, Timothy; Basic Books; New York, New York, 2010. A re-examination of the history of the region comprising what is modern-day Poland, Ukraine, Belarus, Russia and the Baltic states, from the 1930s thru WWII, in particular the political and military actions which caused tens of millions to die during the period. Includes specific focus on actions and reactions in what is now western Ukraine. Snyder, Timothy; Vintage; London, 2016. An exploration of the German and Soviet ideas and politics which enabled the Nazi Holocaust, including a history of the motivations and methods which drove the killing of over a million Jews in pits and ravines before the gas chambers became operational. Redlich, Shimon; Indiana University Press; Bloomington, 2002. Based on research and interviews with Jewish, Ukrainian, and Polish residents and former residents of pre-war and wartime Berezhany near Rohatyn, historian and Jewish survivor Redlich assembles a personal and local history of his boyhood town from multiple perspectives and with multiple voices. A landmark historical analysis and a step toward less-hardened memories and reconciliation. The issues and Redlich’s journeys back to Ukraine and Poland are also subjects of a 2014 documentary film created by Slawomir Grünberg and Katka Reszke, titled Shimon’s Returns. Dean, Martin, Mel Hecker, eds. ; United States Holocaust Memorial Museum and Indiana University Press; Bloomington, 2012. A work in progress by the USHMM, this series has already produced an important volume on the Holocaust as it developed in Rohatyn and the surrounding area through the German-created Jewish ghetto system and local killing fields in east-central Europe. Volume II includes a detailed overview of the system and progress, followed by articles on every ghetto (including Rohatyn and more than 50 other ghettos in the Distrikt Galitzien (former eastern Galicia). A future volume will detail the death camps, including Bełżec where many of Rohatyn’s Jews died. See also our summary of Encyclopedia Volume II. Beorn, Waitman Wade; Bloomsbury Academic; New York, 2018. A study of the complex and multi-faceted nature of the Holocaust as it developed and unfolded in eastern (primarily Baltic, Polish, Ukrainian and Russian) Europe. Using a deep reading of archival records, letters, and other fragmentary materials, the text spans pre-war eastern-European Jewish life through early and post-war Soviet occupation and influence, concentrating on the Nazi occupation years. The study is at once chronological, analytical, and thematic in its perspectives, considering perpetrators, collaborators, resisters, and rescuers. Desbois, Father Patrick. 2007; English translation by Catherine Spencer 2008. New York, New York, USA: St, Martin’s Griffin / Macmillan. Through archival research, ballistic evidence, and new local eyewitness testimonies, sites of Nazi-led mass executions throughout Ukraine are revealed and documented, providing precision and a new understanding of the process of the Shoah east of the death camps. By the head of Yahad-In Unum. Desbois, Father Patrick; Arcade Publishing; New York, 2018. Analysis and interpretation of the principles, methods, and timetable of German mass killings of Jews in the “eastern Holocaust”, by bullets in fields near the towns and villages where the Jews had lived. Based on research by Desbois and his Yahad-In Unum team, the book details all of the common participants in the killing process, from the soldiers who fired the guns to the cart drivers and cooks who supported the work. Although the geographic range of the analysis is wide, the study is directly applicable to the aktions in wartime Rohatyn. Knowles, Ann Kelly, Tim Cole, Alberto Giordano, eds. ; Indiana University Press; Bloomington, 2014. The volume gathers six case studies of spatial analysis of aspects of the Holocaust, ranging in scale from the geography of the concentration camp system, to the ghettos in selected towns, to the “relocation” transport system, to the victim’s body itself, and evaluated with both qualitative and quantitative methods. Includes studies by the editors and by other specialist historians, cartographers, and scientists. Sterling, Eric J., ed. ; Syracuse University Press; New York, 2005. Sixteen essays by scholars and survivors of the Holocaust about Jewish life in forced housing in the ghettos of Europe and elsewhere during World War II. Includes all aspects of life, from the proclamations which created the ghettos to daily hunger and even boredom. One chapter features the wartime autobiographical notes of a Rohatyn ghetto survivor. Gilbert, Martin; Henry Holt and Company; New York, 2004. A study of the actions and words of gentiles (non-Jews) who aided and rescued Jews in hiding during the Holocaust. Includes detailed sections on the the phenomenon, and on rescuers and the rescued in eastern Galicia. Himka, John-Paul and Joanna Beata Michlic, eds. ; University of Nebraska Press; Lincoln, 2013. A collection of original essays on the memory of the Holocaust and the Jewish past in every post-communist state. Edited and introduced by two of the foremost scholars of the recent history of Ukraine and Poland, each is also an author of the chapter on their country of focus. Prof. Himka has uploaded his chapter on Ukraine to Academia.edu. Purchla, Jacek, and Wolfgang Kos, eds., with Żanna Komar, Monika Rydiger, and Werner Michael Schwarz; International Cultural Center and Wien Museum Kraków, Poland; 2014. Available in Polish, German, and English. A carefully researched and richly illustrated album of the international exhibition in Kraków and Vienna, with 25 essays on multicultural Galicia both as it evolved in history and how it was and is imagined, from scholars such as Jacek Purchla, Yaroslav Hrytsak, Larry Wolff, Tara Wozniak, Joshua Shanes, and Martin Pollack. Accompanied by a catalog of the exhibition on thematic and chronological lines, including the myths separately created by Poles, Ukrainians, Jews, and Austrians. Purchla, Jacek, editor-in-chief; International Cultural Center; Kraków, 2015. A bilingual (Polish/English) edition of the Herito quarterly journal extending the exhibition “The Myth of Galicia” (above) and considering the lingering effects of Austrian Galicia and its alternate perspectives in contemporary Poland and Ukraine, in particular around the revolution associated with the Euromaidan and the subsequent armed conflicts in Ukraine’s east. Gruber, Ruth Ellen; John Wiley & Sons; New York, 1994. Beginning with the tangible traces of mezuzahs on homes which were once Jewish, the author weaves artifacts and memories found in her extensive travels in east-central Europe into a selective history, part meditation and part commemoration, of the rich cultural life of Jews before World War II. Observations and discoveries span back centuries, to the birth of Hasidism and the rise of the Jewish wine trade, to the present, and a concerned accounting of both absence and survival of small but enduring Jewish communities in the region. Written before the revival of visible Jewish life in a few of the places she visited, the book serves as record and resource for further study. Gruber, Ruth Ellen; University of California Press; Berkeley, 2002. A study of the rise of interest in Jewish culture in central Europe in recent years, even in (or especially in) places where there are now few or no Jewish communities. The author evaluates “Jewish archaeology” (residual material culture, including cemeteries and buildings), “museum Judaism” (including both museums and heritage travel), and “klezmer in the wilderness” (Jewish traditions re-invented for popular music), each from the perspective and interest of new, non-Jewish followers, and discusses how Europeans deal with the void left by the Holocaust. Zalewski, Andrew. 2014. Jenkintown, Pennsylvania, USA: Thelzo Press. A history of the author’s Jewish ancestry within the context of the political, religious, and social events of the region before, during, and after it was called Galicia. Direct traces of his family history begins in Rohatyn, and facts about life in Rohatyn appear in more than half the chapters. Uhryn-Bezhrishniy, Mykola, editor; with correspondence and articles incorporated from other regional publications. A periodical (mostly weekly) in Ukrainian language published in Rohatyn under German occupation in World War II, 23Jul1941~03Dec1941, sourced from Libraria Ukrainian Online Periodicals Archive. Includes local and national news with a Ukrainian nationalist focus. Boykevych, Oleh; Bona Publishing; Lviv, 2017. An encyclopedic directory of people of the Rohatyn region, the places where they lived and worked, and events of their times. Organized alphabetically. Primarily describes Ukrainian people and events, but with some Polish and Jewish content relevant to the Rohatyn area. Vorobets, Mykhailo; Opillia-L Scientific Publishing Center; Lviv, 2015. A richly-illustrated selective history of Rohatyn and other towns of the Opillya region, with particular focus on church figures and educators and the institutions they founded and developed. Compiled and written by a leading local historian and one of the greatest supporters of Rohatyn Jewish Heritage. Mysyk, N., editor; Triad Plus Publishers; Lviv, 2015. 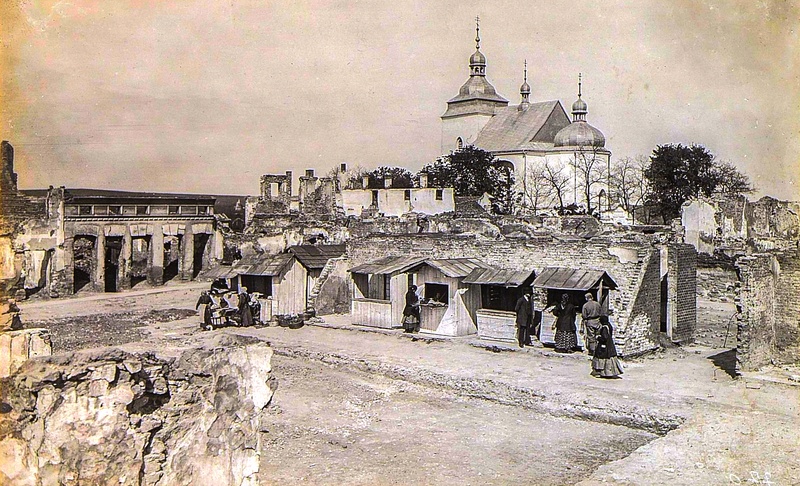 Sixteen essays by as many Ukrainian historians about Rohatyn and other settlements of the region, featuring in particular the village of Kniahynychi and the town of Bukachivtsi. A third of the book consists of a single in-depth survey of archaeological findings in the region and their significance. Other articles of interest cover early regional religious buildings and icons, local designs for embroidered clothing, and folk songs specific to individual villages in the area. Rohatyn’s local history museum opened in late 2018; in four rooms and two vestibules, the exhibits present prehistorical man in the region (from archaeological findings during the past decades), the legend of Roxolana, the developing economy of the Rohatyn area, Ukrainian documents and photos from the late 19th century through WWII, as well as one room devoted to multicultural Rohatyn. In that room, each on their own wall are presented Turkish memorabilia from the time of WWI, the Jewish chronology as well as cultural history in Rohatyn, an impressive collection of Polish and other postcards of the area mostly from WWI and the interwar period, and a beautiful collection of sketched Ukrainian folk designs for embroidered clothing and other uses, created by local pre-war architect and artist Roman Hrytsay. The museum is also a good starting point for tours of Rohatyn and the region. News and information about and by the City. Covers issues of city administration, road works, utilities, cultural events, and a weather forecast. Includes an index to City officials, council members, and a search utility for shops and services in town. In Ukrainian. The city also now has an active facebook page with local news and events and a growing collection of historical photos from Rohatyn and the region, including a gallery of Jewish Rohatyn. “The Center” in Lviv, Ukraine is a private non-profit institution of historical scholarship engaged in academic and cultural activities. Their website is a growing resource for both data and analysis, and a portal for historical and educational projects and publications developed by Center staff and in collaboration with other institutes and individual researchers, in Lviv, greater Ukraine, and across Europe. Also onsite in their Lviv office is an excellent library with books (many in English and German) and other media on urban history and studies, histories of the regions of East Central Europe but especially Galicia and Ukraine, and related material from other branches of the humanities. Besides English, the Center’s website is also fully functional in Ukrainian, Polish, and Russian. A cultural history blog site with particular focus on the traces of physical heritage of the 19th and early 20th centuries in what was then Galicia, today southeastern Poland and western Ukraine. Organized by categories and fully searchable, the posts create a growing online encyclopedia featuring many of the author’s own discoveries and photographs, with historical maps, postcards, and other images shared from other sites. Delightful to browse, and useful as a pocket guide for planning a visit to the region. The site’s reading list, while of course overlapping significantly with ours, offers many other titles to expand one’s perspective on the region and to make new discoveries. In English, with many posts in Ukrainian. More than a genealogy organization, and more than a Jewish organization, Gesher Galicia studies the multicultural history of the former Austrian Empire province of Galicia in order to provide context for research into social changes and the lives of individual families in the region. The quarterly research journal “The Galitzianer” has become a valuable resource for illuminating the peculiarities of Galicia and its local histories. The online historical map room, with over 50 regional maps and more than 125 high-detail property maps of Galician cities, towns, and villages, is a key resource for anyone researching the area. A database and portal for Polin: Museum of the History of Polish Jews, covering the lands of historical Poland, including western Ukraine. The site functions also as a social network and community in that users contribute to tell the stories of their families, their towns, and their histories. The scope of the work is astounding, yet the site is already rich with information covering a large geographic area and a long historical period. A section on Rohatyn was created with input from us and others; more information will always help. In Polish, with a growing number of pages in English. The website of the large new museum in Warsaw is a valuable resource itself. In addition to the Virtual Shtetl portal (see above), the museum also hosts two other information sites: the Central Judaica Database, which digitizes and organizes Judaica collections assembled by institutions and individuals, and the museum’s Resource Center, which collects research materials used in the development of museum exhibitions as well as general references for individual researchers. The world’s largest archive and library focused on “the thousand-year history of Jewish life in Eastern Europe and Russia in all its aspects: language, history, religion, folkways and material culture.” Also hosts cultural and educational events, and publishes works on a large variety of topics. A vast online encyclopedia focused specifically on the people and culture of Jewish east Europe. Includes research articles on history, language, literature and the arts, religion, places, and daily life. The site is a frequent source noted on our history and culture pages. Israel’s official state memorial to the victims of the Holocaust, Yad Vashem is also a strong research institution on the causes and effects of that catastrophe. The center maintains a central database of Shoah victims’ names, another database of names and stories of non-Jewish rescuers of Jews during the war, and a museum and memorial site in Jerusalem for the study and commemoration of this dark period of European history. A French non-profit organization established to research the killing sites and mass graves of Jewish and other minority victims of Nazi mobile murder groups in what s now Ukraine, Poland, Belarus, Russia, and Moldova. Uses archival research and field ballistic evidence together with local eyewitness interviews to recover history and locate human remains. Presents findings in traveling exhibitions and the organization website (including an interactive map), and develops public education resources to open dialogue on the difficult past. A global intergovernmental membership alliance which strives to promote Holocaust education, remembrance, and research in Europe and around the world. Composed of more than 30 member countries and founded on the principles of the Stockholm Declaration, the Alliance research projects result in educational materials and academic publications, including the 2015 Killing Sites – Research and Remembrance conference proceedings with expert lectures on historiography, archaeology, Jewish law, and a wide range of regional perspectives. Based in Dnipro, Tkuma is a 20-year-old research center for Holocaust studies in Ukraine which develops materials and programs for education and intercultural dialogue. Tkuma also conducts international scholarly conferences seminars, publishes a journal and numerous monographs and other books, and maintains a community center and museum on Jewish Memory and Holocaust in Ukraine. A cluster of research projects in collaborative work by scholars at the University of Virginia and the Center for Urban History of East Central Europe in Lviv, including among others a broad and multi-layered GIS mapping project on the Holocaust in Eastern Europe, which includes draft visualizations of aktions based on data in the USHMM Encyclopedia (above). The website also posts a useful bibliography of selected readings on the topic. A component of Stanford University’s Spatial History Project, the collaborative brought together researchers interested in studying the where of the Holocaust as an essential concept along with who, when, what, why, and how. Eight researchers together produced a number of case studies gathered into the book “Geographies of the Holocaust” (above) and illustrated on this website with animated and annotated visualizations. A brief article in English on the current town and its history; longer articles are available in Ukrainian, Polish and Hebrew.